Guided tours of the Notre Dame Cathedral are available daily at 10 am, 2 pm and 4 pm. The tour of the Notre Dame Cathedral takes place on a daily basis all over the year. Notre Dame Cathedral is a medieval Catholic cathedral that resides in the centre of Paris, France. It’s renowned for its spectacular Gothic architecture and is one of the most popular tourist attractions in Paris. Why is the Notre Dame Cathedral so important? Often also referred to as Notre-Dame de Paris, the cathedral is the most famous Gothic cathedral from the Middle Ages and is primarily known for its impressive size, architectural intrigue and antiquity. Built between 1163 (during the reign of King Louis VII) and 1345, the Notre-Dame de Paris translates to ‘Our Lady’ and is dedicated to the Virgin Mary. In 1804, the cathedral was close to being destroyed but Napoleon saved it and crowned himself Emperor inside the cathedral. It is also considered to reflect the important role that Paris had in the 12th century as an economic and spiritual centre. Notre Dame Cathedral is also still used today by the Roman Catholic Church for Sunday Mass and it is also the seat of the Archbishop of Paris. The Cathédrale Notre-Dame de Paris is one of the finest examples of French Gothic architecture and is home to some stunning highlights and important features for you to admire. While the cathedral towers have always been a magnificent feat, there were made even more famous due to Victor Hugo’s novel. Huge invented the character ‘Quasimodo’ and had him live in the south tower in the novel ‘The Hunchback of Notre Dame’. The towers are approximately 223 feet high and offer stunning panoramic views of the city. The south tower is home to Notre Dame’s impressive 13-tonne bell; at the top, you can also find the beautiful spire that was destroyed during the French revolution but later restored by Viollet-le-Duc. The interior of Notre Dame Cathedral is just as beautiful and impressive as the exterior and features vaulted ceilings, long halls and soft light throughout, thanks to the intricate designs of the stained-glass windows. There are three main stained-glass rose windows inside the cathedral and they’re one of the most notable features inside Notre Dame. The organs of Notre Dame Cathedral are centuries old but were restored in the 1990s and are amongst the largest organs in France. There’s also a choir inside the cathedral that portrays the Last Supper, as well as a statue of the Virgin Mary and Christ child. The Façade of Notre Dame Cathedral has many aspects to it and is recognised all over the world. From its astonishing Gothic design, to the vast plaza where you can obtain a spectacular view of the façade’s delicately decorated portals. The left-side portal depicts the life of the Virgin Mary; the central portal depicts the Last Judgement (where a reigning Christ statue can be found) and the right-side portal features Notre Dame’s oldest and most spectacular statuary of the Virgin Mary on a throne, cradling a baby Jesus. As well as all the wonderful features inside Notre Dame, you can also enjoy the giftshop and museum where you’ll find souvenirs to document your time in the cathedral. The giftshop can be found inside the main hall of the cathedral and sells everything from Notre Dame-themed mugs, t-shirts, jewellery and postcards. The museum isn’t located inside the cathedral itself, but just around the corner and includes information all about the cathedral, its history and its fascinating story. Below you can find some of the customer reviews of Notre Dame Cathedral, plus find out where in ranks in the list of things to do in Paris! Rated number 5 out of 2,476things to do in Paris. 4.5 stars out of 68,744 reviews. Below you can find some of the most fascinating facts about Notre Dame Cathedral. It is built upon an ancient Pagan city and the remnants of a temple. The cathedral’s roof is home to one of the oldest surviving wooden frames in the whole of Paris; it contains approximately 52 acres of trees inside its roof! The north tower of Notre Dame is slightly bigger than the south tower. Notre Dame Cathedral played a huge part in the inspiration and personification of Victor Hugo’s 1831 novel, ‘The Hunchback of Notre Dame’. The Notre Dame organ contains almost 8000 pipes and is thought to be the largest one in France. It is the most visited monument in Paris; even more so than the Eiffel Tower! Notre Dame Cathedral is home to the Holy Crown. Some of the stained-glass windows are thought to date all the way back to the 1200s. The largest bell in the cathedral resides in the south tower and weighs 28,000 pounds. The ‘twin’ towers each have 387 steps. Construction began on the cathedral in 1163 but it didn’t officially open until 1345. Over 13 million people visit Notre Dame Cathedral every single year. There are numerous small statues on the outside of the cathedral that serve as water spouts and to support columns. In 1965, a crypt was built to house the ruins that were discovered during its construction. The tours featured below are the very best to embark on when visiting Notre Dame Cathedral. You’ll find the best deals and value for money when it comes to touring the cathedral. What’s the tour all about? On this tour you’ll get a chance to see everything that Notre Dame has to offer, with the help of a guide who can provide you with all the valuable information you’ll need. Your English-speaking tour guide will teach you everything you want to know about the cathedral, and you’ll delve insight its eclectic past. This tour allows you to skip the line with priority access to one of the most famous cathedrals in the world. You’ll also benefit from an audio guide that’s available in 8 different languages. With this skip-the-line tour, you’ll not only gain fast track entrance to Notre Dame, but entrance to the towers is also included in the price of your ticket! You’ll get the chance to explore the world-famous Notre Dame, without queuing for hours. This tour takes you on an incredible exploration of Notre Dame Cathedral and Sainte Chapelle. You’ll hear all about the cathedral enigmatic history and gruesome tales from your expert, English-speaking tour guide. On this tour you’ll explore the historic past of below the streets of Paris, right under Notre Dame. The Archaeological Crypt is a fascinating time capture where you’ll discover all about the ancient remains of Paris’ first settlements! Make the most of your trip to Paris with a visit to Notre Dame and skip-the-line access to the top of the towers. Once you reach the top, you’ll be greeted with stunning views of the city below. This tour allows you to take a self-guided walk around Sainte Chapelle and marvel at its impressive 1000 stained-glass windows. 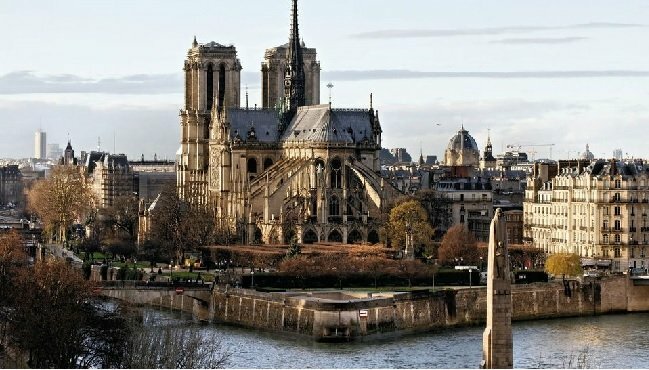 With this tour, you’ll get the chance to visit some of Paris’ most iconic landmarks, including the spectacular Notre Dame Cathedral. You’ll enjoy a tour of both the inside and outside of Notre Dame with binoculars so you can see the magnificent Gothic building up close and personal. On this tour of Notre Dame, you’ll be joined by an expert, English-speaking tour guide who will take you on a journey through the towers where you’ll learn more about their history and importance for the cathedral. As you can see from above, Notre Dame Cathedral is definitely worth a visit during your trip to Paris. It’s one of the most iconic religious structures in the world and is the most-visited place in Paris, with over 13 million visiting the cathedral each year.